Here are a number of videos forming our series of informative documentaries. We hope to add to this collection in the coming months to help new beekeepers with some of the practical aspects of the pastime. If you have any special requests please e mail and we will do our best to help. If you are using a Firefox browser, you may need to remove 'Content Blocking' to reveal all the videos, by clcking the Shield icon that appears beside the address of the web site. Select the arrow beside Keep Blocking and select Disable Protection on This Page. One of our 2017 breeder queens getting on with the job in hand, lovely colony, should be good daughters. 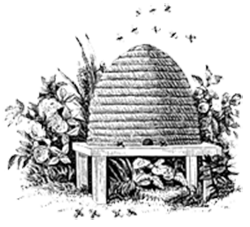 Sarum Bee Supplies of Salisbury, Wiltshire for all your beekeeping requirements with tailoured bee training courses by Kevin Horner available. Getting themselves sorted out after a full inspection, second brood box and second super added. Sarum Bee Supplies of Salisbury, Wiltshire for all your beekeeping requirements with special bee bee keeping training courses available.